March 19, 2015, 10:34 a.m. There were few significant changes in taxes in yesterday&apos;s budget, but what might the best options be for the manifestos? Prior to yesterday&apos;s budget announcement, many newspapers trailed Conservative plans to cut inheritance tax. The policy failed to make it into the budget due to Lib Dem opposition, however. A new YouGov poll for Red Box asks "How fair or unfair do you think the following types of taxation are?" The chart below shows the fairness ratings by the general population, and it is interesting that supporters of the four main parties more-or-less agree on the order. 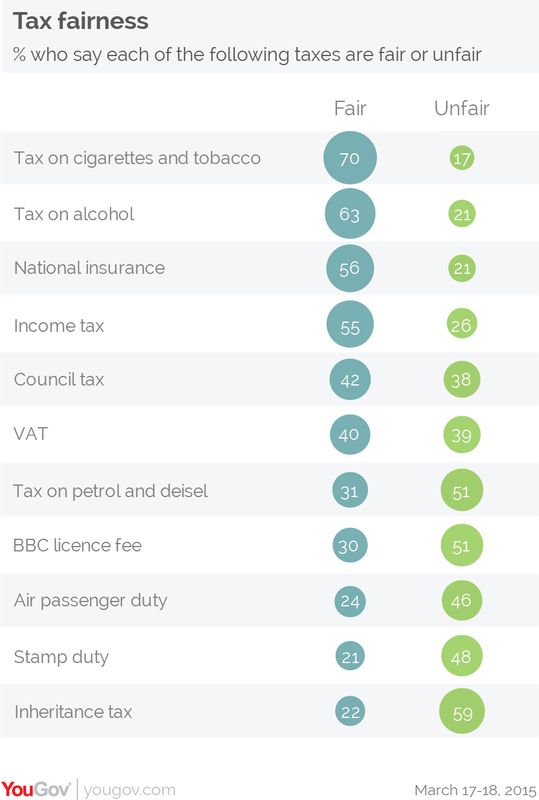 Indeed all, including Labour supporters, consider inheritance tax the most unfair of the eleven, and all place the "unhealthy consumption" taxes, on tobacco and alcohol, at the top as the most fair. Overall, Ukip supporters are most likely to find any of the taxes unfair, and Lib Dems are the ones most likely to find them fair.